"...In this scene you can see the construction in progress and a notation as to which unit was doing the construction -- Co. A., 237th, 1106th Engineer Combat Group. An additional note says: "The longest fixed Bailey in the ETO. Roer River Crossing 250 feet long." There appears to be a P-38 flying above the bridge..."
This "Battlefield Art" image depicts the following scene. An Infantry Support Bridge under construction over the Roer River by Co. C., 237th Combat Engineer Battalion. Captions on the print state: TRY AGAIN! 52 Casualities, but They Got it Across.Infantry Support Bridge. Roer River. 237th Engrs., 1106 Engr. Combat Group. Additional captions read: Under Machine Gun and Direct Artillery Fire and a Turbulent River. The newest "Battlefield Art" image was sent to us by Mr. William "Bill" Lloyd, of Newport, NY. Mr. Lloyd's father, PFC. William Lloyd, was attached to C Company of the 237th Combat Engineer Bn. and served in the European Theater in Normandy and was with with the 237th during their crossing at the Roer River and onto the Rhine River Crossing. Mr. Lloyd, Sr. never did talk about his experiences in the war. It is sad, that these experiences by a man who experienced such events such as these did not leave a record of his personal experiences in a unit such as the 237th. These men did such terrific and dangerous work under extreme combat conditions... while taking horrendous casualities -- and got the job done! We owe a great debt of gratitude to PFC. William Lloyd, and the men who served alongside him for their heroic efforts. We will never forget them. At war's end, PFC. William Lloyd sent the above print home, along with a print of the battlefield map also depicted on this page to his wife. His son is now in posession of the above illustrated print. The art work above is also signed by Lt. Stookie Allen who apparently was attached to the 237th Engineers. Lt. Allen was an artist before and after the war and was a writer as well. A search of the internet did find some works listed by this prolific artist. A special THANK YOU goes out to Mr. William "Bill" Lloyd of Newport, NY for his kind gesture in allowing us the use of the new "battlefield art" image depicted above. The engineers taking the infantry across the Rhine River below Bonn, Germany. The unit identified in this drawing by Lt. Stookie Allen is the 501st Light Pontoon Company, 1106 Engr. Combat Group. VII Corps. U. S. Army. The Platoon is led by Lt. Leon Revien of Brooklyn, NY. A special THANK YOU goes out to Mr. Harold Moody of Hopedale, MA for his kind gesture in allowing us the use of the new "battlefield art" image depicted above. Some of the men who served in the 663rd Engineers, 1106th Engineer Group which was assigned to the 104th Infantry Division on: 9 November - 15 December 1944 and then again on 5 February - 7 March 1945. One man is "added in" by a pencil sketch, apparently by Lt. Stookie Allen. He is identified as Herman "Brooks" B. Spradling who was killed in action near the Rhine River on 27 March 1945. It appears that from the mailing tube, that the artwork, along with another print and additional paperwork, were mailed to a Mrs. Eunice B. Spradling, of Madison, WV. Location of the "added in sketch of Herman "Brooks" Spradling. Enlargement of the "added in sketch of Herman "Brooks" Spradling. Enlargement of the "Notes from Allen's Scrap Book"
Enlargement of the "Reproduced by 663rd Engineer Co. U.S. Army, 1945. Document for Herman B. Spradling, Killed in Action. Image #6: Ft. Belvoir, VA. The above image contains a couple of notations indicating locations where the original owner's barracks were located. A special THANK YOU goes out to Mr. David K. Sauerteig of Knoxville, TN for his kind gesture in allowing us the use of the new "battlefield art" images depicted above. For additional information regarding the 104th Infantry Division, to which the 663rd Engineers were assigned, you can visit the following excellent web site. We originally began this page to illustrate a particular battlefield sketch of the crossing of the Roer River on 23 February 1945 because it related to a number of stories depicted on this web site. These stories were from men of the 102nd Infantry Division, 405th Regiment, Co. F., affectionately known as "Those Damn Doggies in F."
However as we placed the initial images on the web site in our 102nd Division section, we started reiving additional information about the artist and his artwork, as well as the unit that he served with. 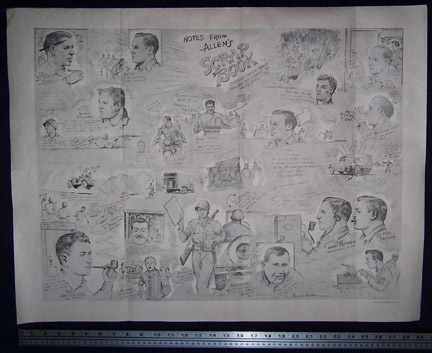 Below is additional information relating to that Battlefield Artwork of Lt. Stookie Allen. The information has been received as a result of a number of inquiries as well as contributions from viewers of this web site. We welcome all additional information regarding the interesting concept of Battlefield Art -- as depicted by battlefield artists such as Lt. Stookie Allen. "... I came across your website today and found the Stookie Allen artwork very interesting. There has been a copy of the attached Allen drawing hanging in my house since I was a little boy. The S/SGT with the helmet on is my father (supposedly he is also the one handling the outboard motor) and he was very proud of this drawing. The story was that LT Allen could not get his bald head drawn right, so he put a helmet on him...Unfortunately, my father did not document any of his experiences during the War. He passed away 3 years ago...Harold Moody Hopedale, MA..."
"...very interesting photo's of Lt.Allens artwork.I have a few of them myself from my father's (TSgt. Lawrence Murdock) collection. Would love to get in touch with any surviving members of the 237th [Combat Engineer Battalion] and find our more about my father, who sadly passed away many years ago while I was very young. Please get back to me with contacts,if possible and forward this info to anyone interested. Thanks a million. Larry Murdock, Mastic Beach,NY..."
Recently, we received an e-mail message and a follow mailing from a former member of the 663rd Topographic Engineers -- attached to 7th Corps forward Headquarters. In part, here is the information imparted to us with regards to the "Battlefield Art" of Lt. Stookie Allen. "...In response to your letter dated October 17th I can provide the following information. I was a member of the 663 Topographic Engineers attached to 7th Corps forward Headquarters. 7th Corps landed on Utah Beach on D-Day and was the spearhead Corps of the First US Army, all across Europe from Normandy to the end of the war. Our function was to produce the many maps needed for the various campaigns. Our company of 120 men was divided into 4 platoons: Survey, Photomapping, Reproduction and Headquarters. Maps were produced on mobile field equipment following 7th Corps battle lines. We produced many maps of various types totaling 4,000,000 copies. During our free time between maps we produced various intelligence reports and printed the drawings that you sent me copies of. I managed to save a copy of each of theses sketches rolling them into a map-tube. They are now in my sons possession near Buffalo New York. There were approximately 40 to 50 different reproduced sketches. They were not "trench art" as you described them, but were produced at the direction of the Corps Engineer for archival purposes. They documented the activities of the various combat engineer units in the Corps. In addition to Lt. Stookie Allen there were several other official artists doing the same work. Their art was all of professional quality. I can not give you their names as they are at my son's home carefully packed and sealed along with many of the different maps that we produced. We met with these different artists on an on-going basis to discuss the technical aspects of their reproduction using offset lithography. This is as much as I can tell you about how they came about..."
Information below is taken from a brochure depicting the duties of the 663rd Engineer Topographic Company. A Lyburn House, our home until the invasion, maps of Utah Beach in Normandy were prepared for D-Day. Additional maps, scale models and data were compiled by Survey and Photomapping personnel of the company operating in London, Plymouth and Paignton. The topographic information thus furnished assisted the VII Corps assault troops on D-Day. We landed on Utah Beach in Normandy and as a part of VII Corps; U.S. First Army and remained with that organization throughout the European Campaign from Normandy to Leipzig, in Germany, our location on V-E Day, strategic and tactical matter was compiled and printed on a 24 hour work schedule under adversities of weather, deadlines, and movement as well as occasional enemy action. Over four million press impressions were printed during that period of time. The work of the Survey Platoon consisted of: road and bridge reconnaissance; preparation of sketches and detailed plans of captured German rocket and V-bomb sites and field fortifications; establishment of Horizontal Control for the Artillery; furnishing of precise grid and geographic data for Radar Stations; checking of existing German Triangulation Data from Aachen to the Rhine River and in the Halle and Leipzig Areas; and the conversion of captured German Trigonometric Data into SHAEF values. The platoon also furnished company security and, during the Battle of the Bulge, was called upon to maintain road blocks and to patrol designated areas. The Photomapping Platoon concerned itself mainly with the following: Tactical Studies of the Terrain, covering VII Corps path from Normandy to Berlin with emphasis on terrain features; Photographic Reconnaissance was made from which detailed drawings were executed of the Roer River, the Erft River, the Bruhl Pits, the Elbe and the Mulde Rivers; twenty detailed 1: 5000 maps of the Rhine River assault sites using aerial photographs exclusively; revision of existing German 1:25,000 maps from aerial photographic reconnaissance; many uncontrolled mosaics some of which were: St. Lo, Roer River, Duren and the Erft River; 1: 25,000 overlays of German Defense Systems in conjunction with First Army A. P. I. D.; Layer Tinting of 1:25,000 and 1:50,000 maps for the Chief of Staff, VII Corps, and many miscellaneous items some of which were: drafting of Artillery Observation Areas, Unit Citation Sheets situation overlays, etc. The Reproduction Platoon, the printing and -- photographic section of the company, reproduced the following: aerial maps and drafted maps, in three and four colors, to scales of 1:25,000 and 1:50,000; Tactical Terrain Studies; revised editions. of captured German maps; defense overlays; mine field and bridge reconnaissance sheets; Artillery and Survey forms, and special large scale maps of tactically important assault sectors. Enlargements of aerial photographs were made for the use of Photo Intelligence, as well as the processing of aerial and field camera negatives. Aside from work of a direct military nature, educational pamphlets, unit newspapers, road signs, Operational Campaign Brochures, material for the Chaplain's Office and Seasonal Greeting cards were printed. The Headquarters Platoon performed the administrative functions of the company. These consisted of maintaining efficient Supply and Mess sections, operating the Motor Pool, providing Postal services, supplying purified drinking water and water for the operation of Reproduction equipment, coordinating the work of the various platoons in the company and contributing services to the entire company which made it a well functioning organization. A VII Corps Map Depot was assigned to us soon after we landed in Normandy and distributed many of the maps used during the campaign. The entire platoon, along with the Survey Platoon, was charged with company security. The 663rd Engineer Topographic Company has participated in every phase of the VII Corps operations in Europe from the early planning and rehearsal stage to the arrival at the Elbe River in Germany. A detachment from the company most ably assisted in the staging of the rehearsal exercises at Slapton Sands. The Survey Platoon landed on the Cherburg Peninsula shortly after D-Day and participated in the early engineer reconnaissance of the Cherburg Peninsula. This platoon also assisted in the provision of Artillery control. The work of the platoon was frequently conducted within range of the enemy and under hazardous conditions. The Reproduction Platoon has maintained a night and day schedule for a full year supplying a tremendous volume of maps essential to the operations of the VII Corps. The Photomapping Platoon has contributed many detailed photographic studies of great value to attacking units. The work of the company as a whole has been characterized by technical accuracy of a high order, long hours regardless of adverse weather conditions and many moves, and speedy execution of difficult assignments. I add my personal commendation to that of General Collins for the splendid work by the 663rd Engineer Topographic Company in preparation for and throughout the campaign in Europe. The above information was generously provided to World War II Stories -- In Their Own Words by Mr. Paul Bleier of Coconut Creek, Florida. Mr. Bleier was a member of the 663rd Engineer Topographic Company and served during the time that this unit was operating in the ETO. Mr. Bleier also knew the artist who drew the following "battlefield artwork" -- Lt. Stookie Allen. We wish to express our deepest gratitude for Mr. Bleier's allowing us to share the above information. We have just received the above information with regards to Lt. Stookie Allen and his artwork. The above is a book by Stookie Allen printed prior to the war. By clicking on the above link, you can view the book page-by-page OR if you click on the second link, you can view the book by individual pages (all captioned by subject). This remarkable information was just passed on to us by Mr. Arthur Lortie of Taunton, MA. Mr. Lortie is currently working on a biography of Stookie Allen. This work should be completed in a couple of months and hopefully we will then have additional information to share. Additional Materials added to website on 3 May 2003. Additional Materials added to website on 20 December 2003. Additional Materials added to website on 29 March 2004. Additional Materials added to website on 20 August 2004. Additional Marerials added to website on 15 March 2005.